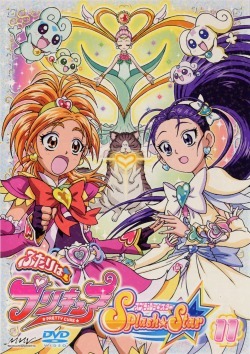 One day, they meet at that tree, and encounter Flappy and Choppy from the "Village of Springs," and transform into the legendary Pretty Cure warriors! With their home captured by the land of ruin, "Dark Fall," to restore the World Tree and the Seven Springs, the two must fight against evil power! Eighth grader at Yuunagi Junior High and pitcher for the softball team. Always puts people in a positive mood. Her home is a bakery called "PANPAKA Pan." Her catchphrase is "I'm in top form! (Zekkouchou nari!)" A baker at Panpaka Pan. Really has it together, and puts lots of love into the bread she makes. A patissier at Panpaka Pan. Kind and very reliable. Second grader at Yuunagi Elementary. Docile and cute, but a bit spoiled. Eighth grader at Yuunagi Junior High, and member of the art club. Returned as an eighth grade transfer student in the new school year. An art club member who loves to draw pictures. When drawing she becomes dazed and doesn't pay attention to her surroundings. Lives in an astronomical observatory. An archaeologist. A bit too enthusiastic about her research, and tends to work all night against her better judgment. An eleventh grader attending Seikai High School, the only university prep school in the prefecture. Cool and kind. Mai's confidant, and Saki's crush. "Dual Spiritual Power!" "Hana hirake, daichi ni!" "Habatake, sora ni!" "Kagayaku kin no hana - Cure Bloom!" "Kirameku gin no tsubasa - Cure Egret!" 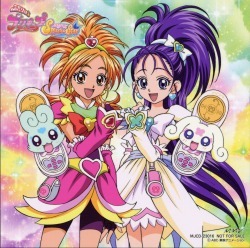 "Futari wa Pretty Cure!" "Sei naru izumi o kegasu mono yo..." "Akogi no mane wa oyamenasai!" "Daichi no seirei yo..." "Oozora no seirei yo..." "Ima, Pretty Cure no tomo ni..." "Kiseki no chikara o tokihanate!" "Pretty Cure Twin Stream...Splash!" 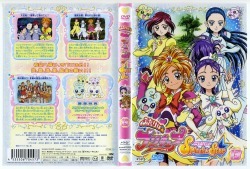 Pretty Cure Spiral Heart Splash: Obtained with the Spiral Rings. More powerful than Twin Stream Splash. "Seirei no hikari yo! Inochi no kagayaki yo!" "Kibou e michibike futatsu no kokoro!" "Pretty Cure Spiral Heart...Splash!" The spirit of flowers from the Village of Springs. 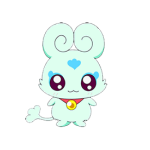 Flappy gives his flower spirit powers to Saki so she transforms into Cure Bloom! 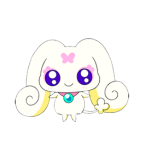 Cure Bloom's partner. Ends sentences in "lapi." The spirit of birds from the Village of Springs. Choppy gives her bird spirit powers to Mai so she transforms into Cure Egret! 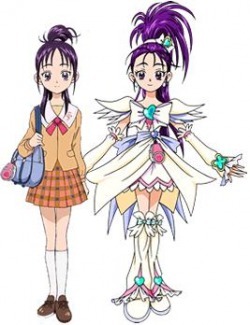 Cure Egret's partner. Ends sentences in "chopi." An assassin of Akudaikan, ruler of Dark Fall. Rules the "Spring of Trees," thus manipulates the spirits of trees. Subordinate of Akudaikan, ruler of Dark Fall. No matter who he's under, he always comes off as disagreeable. An assassin of Akudaikan, ruler of Dark Fall. Rules the "Spring of Fire," thus manipulates the spirits of fire. Has a cheerful personality, and always creates rhythm to dance to. Transferred into Saki and Mai's class to search for the strength of Pretty Cure. Claims to be a faithful servant to Akudaikan, but her true identity is wrapped in mystery. An assassin of Akudaikan, ruler of Dark Fall. Rules the "Spring of Earth," and can shoot thread-like material from his hands to trap others in sticky mud. Princess of the Village of Springs. Hid herself to protect the Spring of the Sun, but when one of the springs taken away by Dark Fall is restored, she is able to appear. Ruler of Dark Fall. Took away the Village of Springs to destroy all life. To defeat the legendary Pretty Cure warriors, he sends out various assassins. The spirit of the moon from the Spring of the Sky. 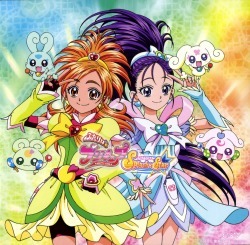 Grants Saki the power to transform into Cure Bright. Ends sentences with "mupu." The spirit of the wind from the Spring of the Sky. Grants Mai the power to transform into Cure Windy. Ends sentences in "fupu." Intro Speech: "Dual Spiritual Power!" "Mirai o terashi!" "Yuuki o hakobi!" "Tenkuu ni michiru tsuki - Cure Bright!" "Daichi ni kaoru kaze - Cure Windy!" "Futari wa Pretty Cure!" "Sei naru izumi o kegasu mono yo..." "Akogi no mane wa oyamenasai!" 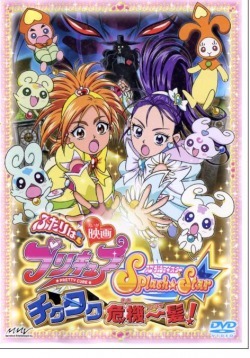 Pretty Cure Spiral Star Splash: An alternate version of Spiral Heart Splash. "Seirei no hikari yo! Inochi no kagayaki yo!" "Kibou e michibike futatsu no kokoro!" "Pretty Cure Spiral Star...Splash!" An assassin of Akudaikan, ruler of Dark Fall. Rules the "Spring of Water." 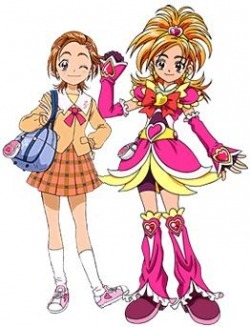 Skilled at disguising herself, and takes on various forms to get close to Pretty Cure. Has high pride and a hysterical personality. An assassin of Akudaikan, ruler of Dark Fall. Rules the "Spring of Gold." Never misses a chance to weight train, devoting himself to drills every day. 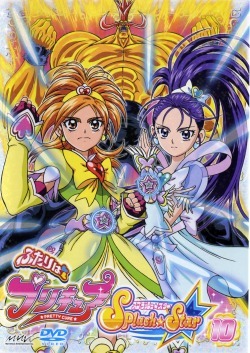 Obsessive about fighting with Pretty Cure fair and square. Saki Hyuuga is an energetic eighth grader. One day, she meets an unfamiliar girl under the Sky Tree at the edge of town. She's Mai Mishou, a girl she first met on the night of the summer festival when they were young. The two carry out a fateful reunion. Immersed in deep emotion, before long the spirit of flowers, Flappy, and the spirit of birds, Choppy, appear before them. They're being pursued by a mysterious foe named Karehan. 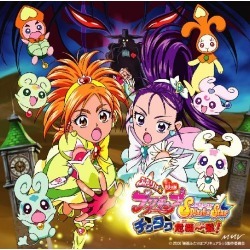 Saki and Mai transform into the legendary Pretty Cure warriors and face Karehan! Saki is busy setting up a welcome party for Mai, who just moved into town, when Karehan appears again! They transform once again to protect the party! It's the softball district preliminaries, and Yuunagi is facing off against last year's champions! Saki thinks there won't be a problem, but they really do have a tough time. Thanks to Mai, the team is able to regain their usual mannerisms, but there's a gust of wind as Karehan appears again...! Mai is looking for something to display for the art club contest with the theme of "spring scenery," and hears cicadas as she walks through the ash tree forest. But why so early? Then Karehan appears, but Saki and Mai are separated and can't transform...! I'm Saki Hyuuga. Today is Unabara City's Pride Tournament! I'm going to participate by debuting with Mai, but I overslept; this is seriously awful! Somehow even though I'm filled with joy as I participate in top form, Mai and I get in a big fight this time?! Such an unpleasant mood all of a sudden~ In that situation I rushed off the stage, so I forgot the lyrics! Shouting from my heart, "What should I do! Oh, make time stop!!"...Huh?! Time has really stopped!! Then suddenly two spirits named Hours and Minutes appear! Trying to keep up with them, we're led to the Village of Clocks! The "Infinite Clock," which governs the time of all worlds, has been stopped by a mysterious man named Sirloin in order to obtain the world! We won't forgive you for taking away everyone's time! We'll definitely protect this precious time!! 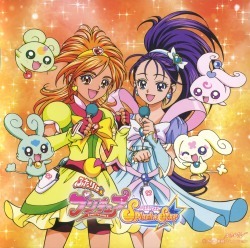 Futari wa Pretty Cure Splash Star Theme "Makasete Splash Star"
Futari wa Pretty Cure Splash Star Vocal Best!! 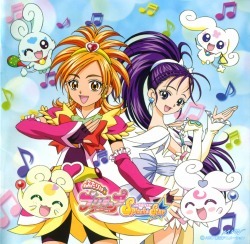 Futari wa Pretty Cure Splash Star Soundtrack 1: Pretty Cure Sound Shower! 11. 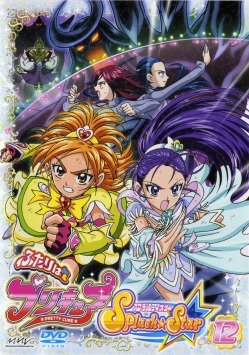 Pretty Cure Henshin Splash☆Star! 14. 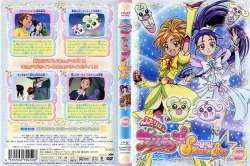 Pretty Cure Twin Stream Splash! 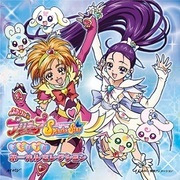 Futari wa Pretty Cure Splash Star Soundtrack 2: Pretty Cure Sound Splash! 16. 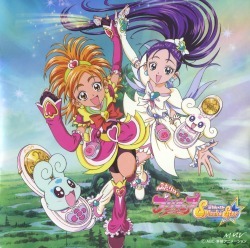 Pretty Cure Spiral Heart Splash! 36. 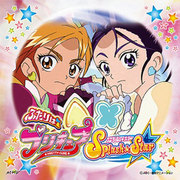 Pretty Cure Spiral Star Splash! 24. 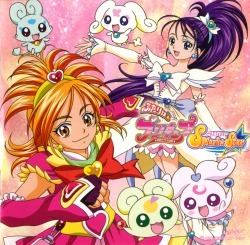 Pretty Cure Spiral Star Splash! In all ten stages, Saki and Mai go on with their varied daily lives!! 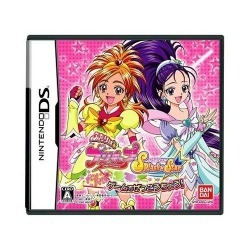 While you help at PANPAKA Pan and play with everyone at school, you can transform into Pretty Cure and defeat Uzainas. Advance through super fun stories and raise Saki and Mai's friendship!